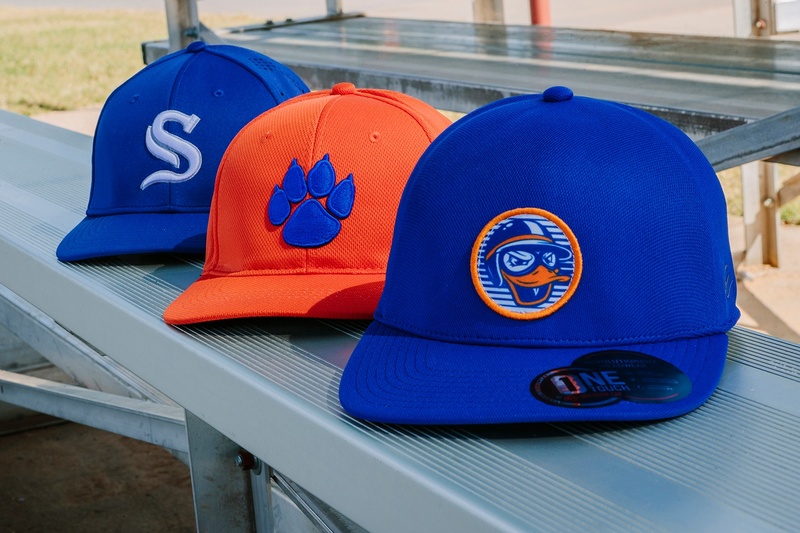 OC Sports studied trends among players from professionals down to tee-ballers, and developed a line of new styles to meet the needs that weren’t yet being filled. Other styles were designed with coach and fan needs in mind. Today we’re going to take a close look at our four favorites. We cannot wait for you guys to get your hands on these caps, and I think you’ll see why after reading this article. The ALL-STAR is a performance cap made with Cage Mesh and a Q3® wicking and cooling sweatband. It has embroidered star eyelets and a flat visor that can be easily shaped. It comes in five color options. The AIR25 is a new style with perforated side panels for optimum ventilation. This ProFlex® stretch-fit cap has a slightly pre-curved visor with a black anti-glare undervisor, and Q3® wicking technology to keep players cool and dry on the field. Choose from our 27 color combinations. The CAGE25 is a new style made with a lightweight breathable Cage Mesh fabric, just like the pros wear on field. Cage Mesh is a lightweight, breathable performance fabric with a sharp, clean look and moisture-wicking properties. This ProFlex® stretch-fit cap has a black anti-glare undervisor and Q3® technology. Its visor comes flat, but can be easily shaped and customized as the player desires. There are 46 color options. The CAGE150 is our first cap with the Adjustable ProFlex® closure. It is a Pro Round Crown, and made of our performance Cage Mesh with stretchy mesh back panels and a plastic snapback. It has Q3® wicking technology and a black anti-glare undervisor. Choose from our 12 color combinations. The CTN50 is a new snapback made with a superior cotton twill fabric. It is a classic, 6-panel baseball cap with our all-new Pro Round Crown shape and a slightly pre-curved visor. If you want a traditional on-field look with a more comfortable fit, this cap is perfect. Choose from our 29 color combinations. The HTH25 is a ProFlex® stretch-fit cap with Q3® wicking technology and a black anti-glare undervisor. It has a ProTech Mesh visor that comes flat, but can easily be shaped to the player’s preference. The crown is heathered grey, but the visor comes in seven colors. Plastic snap closures have made a tremendously quick and overwhelming comeback as of late. We knew very quickly after seeing how successful the MBW-800 style was with our customers that we were going to need a snapback version and fast. Our product developers immediately went into action, and we’re proud to say it’s here! The MBW-800SB comes in 32 of our most popular color combinations. The MWS25 is made of our ProTech Mesh with Q3® performance wicking capabilities. This ProFlex® stretch-fit cap has a black anti-glare undervisor and comes in 26 color options. The MWS50 is made of our ProTech Mesh with Q3® performance wicking capabilities, making this cap perfect for serious players. Choose from our 15 color combinations for both adult and youth sizes. All OneTouch by Outdoor Cap products have an active cooling sweatband, Q3® wicking fabric, and a 3D welded OC logo. The cooling sweatband actively decreases in temperature when you sweat. Q3® fabric technology wicks moisture away from the skin and transfers it to the surface for evaporation. What’s your favorite OC Sports style? Let us know in the comments below. You can also follow us on Facebook, LinkedIn, and Twitter.